The Youth Philharmonic Orchestra (of the New England Conservatory Preparatory department) Youth Philharmonic Orchestra (YPO) is the showcase assemblage of the New England Conservatory’s (NEC) preparatory school, meaning it consists of high school age instrumentalists of exceptional abilities. 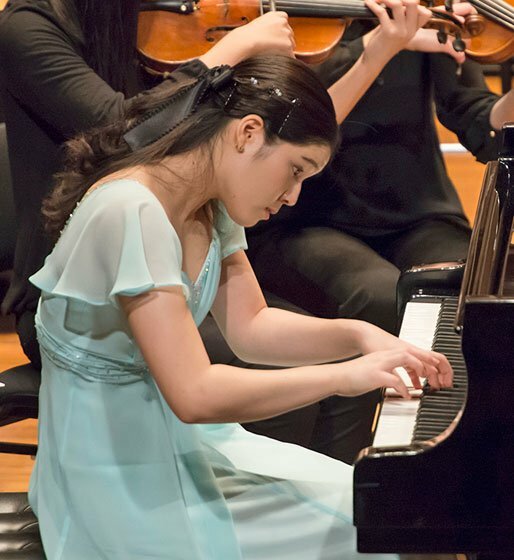 YPO’s concerts in Jordan Hall and then, biannually to quadrennially, on international tours, give the young artists chances to learn the agonies and ecstasies of the profession. 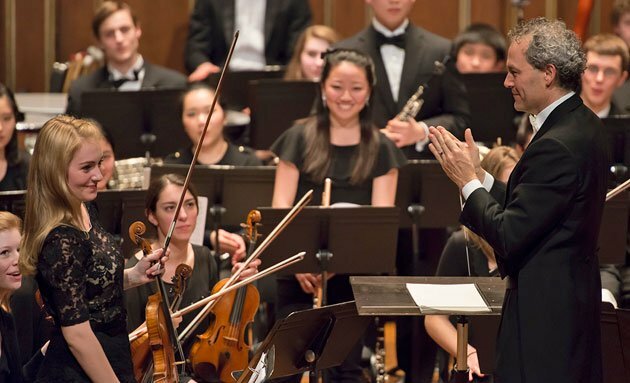 YPO played its second concert of the season on Tuesday in Jordan Hall, for the first time under the direction of James Sommerville; this year they will also perform under the direction of NEC’s Assoc. Director of Orchestras, David Loebel and under NEC Director of Orchestras, Hugh Wolff, no less. Sommerville is best known to Boston audiences as the distinguished Principal Horn of the BSO. All the while he has been honing his conducting career, largely, to date, in his native Canada, and currently serves as Music Director of the Hamilton Philharmonic, with many appearances at other orchestras, up thataway. Sommerville chose a contemporary offering, blue cathedral, the Ravel Concerto (in G) for Piano and Orchestra, and then saddled up the Mussorgsky warhorse Pictures at an Exhibition (Ravel orchestration) for a steaming, snorting gallop across the finish line. The opening piece, blue cathedral, by Curtis faculty composer Jennifer Higdon, is enjoying the interest and attention of orchestra players, and, we would suspect, of audiences as well. Commissioned by, and premiered at, Curtis in 2000, this is an evocative and elegiac movement of about 13 minutes. As Sommerville explained in brief remarks, the work has a compelling “back story” as well. Composer (and flutist) Higdon wrote the piece after the tragic loss of a younger brother, clarinetist Andrew Blue. The work is comfortably planted in the mellower of 20th century orchestral vernacular, with broad swathes of string beds strung across quite diatonic harmonic blocks. While we were trying to think of the closest late 20th century composer to analogize for our reader’s benefit, we kept pulling up the name Delius of all things, in an effort to convey the luminosity of the orchestral effects. Now here, please understand we are unable to resist one irresistible cavil, all in the context of a lovely work. Higdon has deployed a very large orchestral force including four percussionists, yet seems unable to resist the late 20th century mannerism of double-duty assignments. By this we mean the 20th century “de rigueur” of forcing instrumentalists to do something other than play their chosen instruments. This particular reviewer has his tolerance for para-instrumental demands limited to Glenn Miller’s band calling out “Pennsylvania Six-Five Thousand.” Anything beyond that—dropping the violin to rub erasers across the score, dumping the tuba to tinkle thumb cymbals, pulling your oboe reeds out and slapping them together, gargling, and so forth—strikes us, at any rate, as affectation, and demeaning to the instrumentalist to boot. So it was with a heavy heart that saw the string sections armed with Chinese temple bells, the brass battalion supplied with wineglasses filled to various levels in order to produce glass harmonica effects. We cringed when the pianist stood to “prepare” his instrument for the closing bars. In the event, the piano “preparation” consisted of one note only and produced a remarkably appropriate and striking effect. The delicate shimmering of the temple bells slowing penetrated the diminishing orchestral fabric and quite convincingly wafted the work to its ethereal ppp close. Alas, the musical glasses were as perceptible as a harpsichord continuo in the Ring. If the composer really wanted that timbre, perhaps assigning one of her four percussionists to a real glass harmonica, preferably amplified, might be the solution. Not to end on a trifling bitchery, the orchestra played movingly. One cannot imagine a more winning or sympathetic reading of this work. Score one for youthful idealism and sure guidance. Which leads to our observations on Sommerville as conductor. We happened to sneak into the auditorium earlier in the evening while a rehearsal was in progress. Sommerville combines a baton technique of unambiguous clarity with sure musicality and a nurturing demeanor. He sped the ensemble through sections of the Ravel concerto with a real gentleness which we doubt not, in its own way, reaps musical dividends from his young artists. But then, Canadians aren’t temperamentally known for throwing music stands at their players. Also at the rehearsal was a thin, young, almost fragile appearing Hannah Eunsun Byun, the concerto soloist. At a point, the conductor called out a rehearsal number for a pick-up. Byun leaned over, picked up her score from the floor to check the place, dropped it back down and was all set. Good God, the girl knows that music! At the concert, that young Walnut Hill Conservatory senior was gone. A vision in gorgeous, flowing, powder-blue strode out with the impeccably elegant Sommerville. The concerto is quite impeccably elegant as well, unsurprisingly as coming from that impeccable, sly-cat, Ravel. We were surprised to learn there was not unanimous enthusiasm at the concerto’s first presentations in 1932. But what we find particularly interesting is the organic authenticity of the concerto’s jazz—in the thematic material, the instrumental arranging, and in the virtuosic solo passage work, much of the latter sounding remarkably like Gershwin’s bravura keyboard work. While the “jazz” of Ravel’s violin sonata (1927) sounds much like European Cosmopolite Deconstructs Jazz, the concerto’s jazz rings true. In between the two works, from January–April 1928, Ravel toured the USA on an in-depth excursion with ample opportunity for exposure to our real thing. For example, Biographer Roger Nichols notes: “On arriving at the Olympic Hotel in Seattle ‘he [Ravel] was interested in two things—getting his bright blue suspenders shortened and playing ‘Tea for Two,’ Rhapsody in Blue, ‘My Blue heaven’ and other jazz tunes.’ ” Perhaps this explains the difference. Byun (current student of NEC’s distinguished Wha Kyung Byun—no relation) turned in an astonishing performance, as we already suspected seeing her in rehearsal. Technical mastery matched musicality. We were frankly uncertain if we wished for just a bit more power in some of the fortissimo passages, or not. But that being the case, sheer power will naturally follow as she matures chronologically. The ending of the middle Adagio assai was marked by an exquisite duo between the pianist and Derek Wong on English Horn. The movement died away and Jordan Hall—conductor, players and audience—remained suspended for seconds of breathless silence. That’s what classical music can be all about. Ravel’s arrangement of the Mussorgsky is one orchestral monster, with a battery of brass the size of an artillery battalion. From all the wonderful orchestral virtuoso hijinks and irrepressible fun of the percussists’ kitchen, we wish to single out the extraordinarily haunting and refined solo of Havar Njolstad on sax in the Vecchio Castello movement. We also smiled trying to think of the first 1001 reasons Sommerville, having lived these many years at the Horn desk, might find it just irresistible to loosen the reins on his young brass alter egos. Perhaps there was a little orchestral imbalance here. Sitting absorbed as these wonderful young people performed, we thought to ourselves: there must be few if any limits to the orchestral repertory that they can creditably, even competitively, present. If mayhap there were one or two moments when the ensemble lacked perfect precision (the very tricky opening of Ravel first movement), certainly that was a function of limited rehearsal opportunities. That is to say, given the exigencies of these kids’ frenetic lives, their concerts are produced on a scheduling tightrope. All they need to nail down the last perfection is the luxury of extra rehearsals, such as they do enjoy when preparing for international tours. Then I learned that Blizzard Nemo forced the YPO to cancel their last (Saturday) rehearsal before the performance on Tuesday! So we leave with the image of the young Byun plopping her score on the floor and sailing flawlessly into her part, the haunting solo in the “Vecchio Castello” and the fleeting trance after Ravel’s adagio. What they do for love….Has the YPO persuaded us that life, after all, is really beautiful? Tony Schemmer is a New York born composer, frequently performed locally, nationally and in Europe. He returns to Russia this May for concerts of his music in Moscow and St. Petersburg. In the interests of disclosure, Mr. Schemmer serves as an Overseer at New England Conservatory.